Acknowledging the power of colour, and it’s perhaps unexpected connection to our emotions, allows us to realise its full potential. The impact of colour on our daily lives is often instinctive, subconscious and undoubtedly emotive, but why? Colour, put simply, is energy formed from light of varying wavelengths. Each colour is materialised by its own unique wavelength and therefore unique energy; each impacting our visual senses significantly. Dating back thousands of years chromotherapists, or colour therapists, have been known to harness colour and its energy holistically, utilising it as a non-invasive and powerful therapy for finding balance and harmony; positively affecting both the mind and body. Each colour is thought to hold its own benefits based on where they appear within the visible spectrum. Cooler colours red, orange and yellow are located at the top of our visual spectrum, providing stimulating effects. Red, activates and revitalises, orange holds the power to restore whilst yellow fortifies and brightens our inner-self. Lowest on the visual spectrum are the warmer colours, providing calming effects; blue soothes and relaxes, indigo provides purity and focus and violet is there to inspire and support us. Green is located in the middle of the warm and cooler hues, it's power considered a great balance force, harmonious by nature much like nature itself. How we view colour and its effects should be something we carefully consider, utilising these hidden powers to create the specific mood or feeling required from a space, a mindful masterpiece if you will. The balanced and relaxing nature of green for example would be ideal for living or bedroom spaces whilst blue is possibly more ideal for creating a soothing atmosphere in a luxury bathroom. White contains all the colours within the visual spectrum, emphasizing purity and providing clarity to our thoughts. This could be the reason why white is so prevalent in Scandinavia, home to some of the best furniture and product designers in the world who apply a heightened level of detail to their considered and simplistic pieces. Recently however a notable shift has formed within Scandinavian culture with an evident increase in stronger, bolder hues being adopted. Their love of classic pieces of furniture and lighting and their ease of access to it has uniquely allowed them to experiment with colour without the need to redesign their space from scratch. They are able to change the mood of a space using just colour, compensating for the harsh meteorological seasons that dictate their daily lives, whilst incorporating consistently their classic items of furniture. Short days during the winter season force Scandinavians to constantly seek light, in contrast to the summer months where the days draw-out long into the night. A simple refresh of paint work at home can be used easily to balance this, creating interior harmony that doesn’t continually exist outside. Quality in the colours used is equally important. 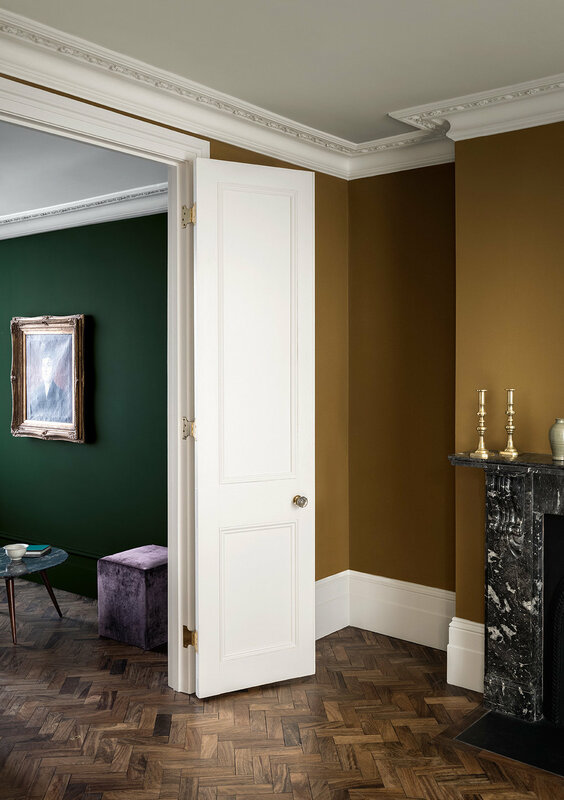 Here at Rachel Usher Interior Design we regularly use British paint manufacturer Little Greene, who offer luxury paints whilst remaining committed to socially and environmentally responsible production. For commercial projects Paint and Paper Library is our brand of choice; their paints officially accredited by the Royal Institute of British Architects. Both brands are available to order and collect from our Bawtry Interior Design Studio in Doncaster, if you’re in need of some sage advice selecting colours however, please do get in touch before visiting us. Whilst our reactions are instinctive to colour based on their unique wavelengths and energy, curating colour combinations can be particularly difficult to navigate. We're proud to offer a colour consultation service, approaching colour in a way that’s personalised to you, informing the mood of your space and ultimately nourishing your soul.